The garden & pet electric fence energizer from Fi-Shock is designed to help gardeners & homeowners to keep unwanted animals out of gardens, flowerbeds & ponds. 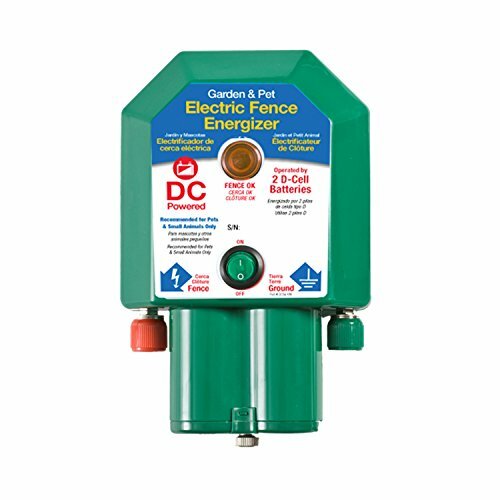 Powered by two d-cell batteries, this fence charger is easy to install & operate. It's also perfect for areas that need protection from pest animals yet have no electricity. Under optimal conditions, this Fi-Shock energizer electrifiesup to one Mile of fencing & can protectup to five acres. The power output measures 7.5Kv +/- 20% open circuit voltage. The garden & pet electric fence energizer isn't just for wild animals, either. Use this charger to Train your pets & keep them from damaging vegetables, fruits & flowers! Fi-Shock offers a one-year limited warranty on the garden & pet electric fence energizer. The package includes an installation instruction booklet & an optional mounting stake. Light-duty energizer perfect for garden protection. Electrifies up to one mile under optimal conditions. Pulsing output for improved safety. Perfect for areas without electricity. If you have any questions about this product by Fi-Shock, contact us by completing and submitting the form below. If you are looking for a specif part number, please include it with your message.